As the summer monsoon season approaches in late June and early July, the evenings here in Tucson, Arizona feel more tropical, with warmer, more humid air. On these languid summer evenings, Paloverde Root Borers (Derobrachus geminatus) can be seen flying around trees looking for mates. 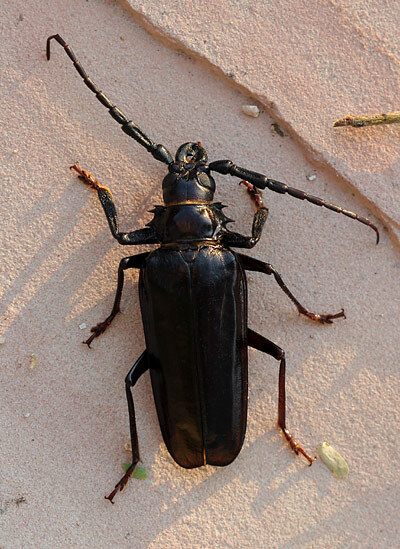 These giant, black beetles can be up to 3 1/2 inches (8.9 cm) long. This particular Paloverde Root Borer was about 3 inches (7.6 cm) long, not including the impressive antennae. Paloverde Root Borers, as evidenced by their unusually long antennae, are members of the Longhorn Beetle Family (Cerambycidae), and like many other longhorn beetles, they are quite destructive. Their plump, white, 5 inch (12.7 cm) long larvae (commonly called grubs) eat tree roots, especially those of paloverde trees, such as the Mexican Paloverde (Parkinsonia aculeata). Paloverde Root Borer grubs will also feed on the roots of other trees besides paloverdes, and the damage these voracious grubs can cause to a tree's root system can prove fatal. If it had been earlier in the day, I would have given this Paloverde Root Borer to the semi-tame Roadrunner that visits my yard (he loves them, even though they're hard to kill because of their tough shells), but he was already roosting for the night, so instead I searched around for an owl to give it to. Not finding one of the usual Western Screech-owls, I instead left the beetle on a wall underneath a family of smaller Elf Owls roosting in a pepper tree. The Elf Owls were awakening and they definitely saw the beetle, so I hope that they'll get rid of it for me, if it's not too large for them to handle. Not only are Paloverde Root Borers hazardous to trees, they are also hazardous to motorcyclists. You definitely wouldn't want to get hit in the face with one of these giant, hard-shelled beetles when traveling at a high speeds! Update: While looking around on the web for information on Paloverde Root Borers (using the search term "Derobrachus geminatus"), I found many websites actually selling these beetles, for an average of about $10 each! I guess that people or institutions buy them for their beetle collections.